I wrote that Game Center is broken, and that Apple told me it will “hopefully” be “resolved” “soon”, but the issues are tough to visualise for anyone who’s not experiencing them. At least, people on Twitter tell me so, and Twitter NEVER LIES. As for what I did next, you probably did guess: I wrote this blog post. So sorry about that misleading heading, but you know how it is online these days — people with SEO hats punch your face in unless you use TECHNIQUES to get people to visit your site. Just think yourself lucky they didn’t make me split this short post up into eleven separate pages. As a gallery. When iOS 9 hit beta last summer, I heard concerns from developers about Game Center. Never Apple’s most-loved app, it had seemingly fallen into a state of disrepair. In many cases, people were reporting it outright failed to work. Six months later, little has changed. If anything, Game Center has gotten worse, with major problems increasingly widespread. These include the Game Center app launching as a white screen, and Game Center freezing the Settings app when you try to access its options. You might wave this away as a trifling problem. If so, I imagine you don’t play games. Game Center isn’t just about logging highscores — it’s also crucial for the functionality of many turn-based multiplayer titles. Without Game Center, they cannot and do not work. Additionally, some games freeze on start-up, because developers had quite reasonably expected Game Center would at least be functional. This makes for angry users, who can’t directly contact developers through the App Store and therefore leave bad reviews. Developers are now updating their apps to effectively check whether Game Center is broken, flinging up a dialog box accordingly, and at least allowing players access. This state of affairs is ridiculous. I have three working iOS devices, and only one now has a functioning Game Center. As someone who writes about iOS games for a living, this issue affects me professionally and impacts on coverage for developers, since I cannot write about games the broken Game Center is blocking access to. But more importantly, it makes me question Apple’s interest in fixing bugs, and especially dealing with anything relating to games. If a critical bug blocked access to any other default app and caused countless other apps on the system to fail, would we still be waiting for a fix six months later? I’ve no idea whether there’s anyone senior at Apple responsible for and advocating on behalf of gaming. If not, Apple should do some recruiting, because right now it feels like the exec team doesn’t give a hoot about games and gamers, beyond the odd high-end title showing off the power of an iPhone or iPad at an Apple event. Further reading: TouchArcade thread Game Center Stopped Working, which has over 50 pages at the time of writing. I missed this a few days ago (9to5Mac), but it turns out Guitar Hero finally showed up on the Apple TV App Store. Announced during the new Apple TV reveal, I wondered how Activision would get the thing working when Apple about-faced on a rule allowing devs to require an external controller for their games. The thought of Guitar Hero on the Siri Remote (which, frankly, isn’t much cop for gaming full-stop) baffled. The answer is Apple’s seemingly subtly changed its rule that all games must support Siri Remote, by adding in white ink on white paper “unless you happen to be a massive company that already had a huge IP in development that wouldn’t work solely with the Siri Remote, OBV“. It’s the right decision, of course. Apple blocking Guitar Hero from Apple TV would be stupid. But it’s maddening that other developers are not afforded the same flexibility. I was today pointed at Benjamin Mayo’s blog post Apple Now Requiring All Apple TV Games To Support Siri Remote Input. As the title suggests, Apple will enforce Siri Remote support for Apple TV games. This is a problem. On Twitter, I’ve had people argue otherwise, suggesting everything is fine. Developers will just find new methods of control input that work nicely with the Siri Remote. This is more or less what happened on iPhone, when people (including yours truly) initially dismissed it as a games machine, due to its lack of non-traditional controls. In the event, devs worked past perceived limitations, and we ended up with amazing and intuitive titles like Zen Bound and Eliss (most recent versions linked to here — buy them both). There is a difference, though. iPhone was a blank slate, and developers took — and continue to take — full advantage. The Siri Remote is by design a more conventional input, because you use it to control something on a screen across the room. There isn’t really any comparison between the two, and I fear the Siri Remote’s comparatively basic input options will lead to a glut of iOS games becoming less innovative as a result. The other angle people are taking is that Apple’s keener on Wii-like gestural input, since the Siri Remote has an accelerometer. Cynics will point out the Wii is a console from 2006 and therefore nearly a decade old, but many of its games are still fun, and gestural input is intuitive. 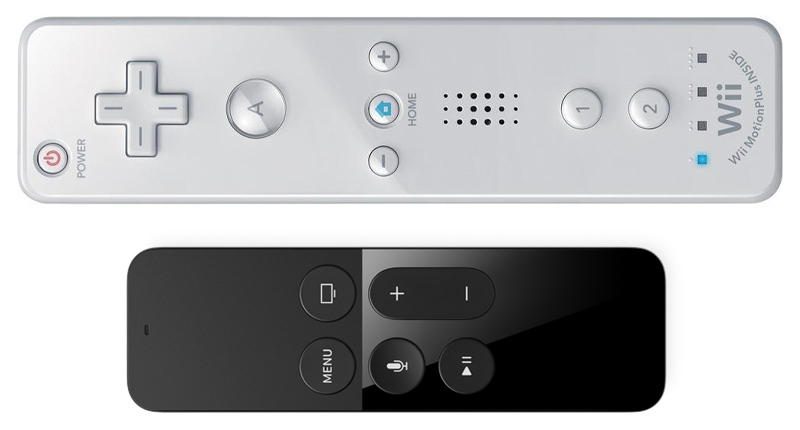 The thing is, Apple’s remote is significantly more restrictive and looks to be more awkward for games than Nintendo’s. In the initial Apple TV promo video Apple ran at its recent event, someone was shown playing racer Asphalt 8 with said remote (held between two hands), and it looked faintly ridiculous and a little painful. Crossy Road was also demoed, using the remote’s small touchpad as a directional controller. That looked OK, but showcased the kind of title likely to find traction on Apple TV (i.e. very basic casual games), and it still had me thinking of cramp. But even Wii comparisons don’t really hold up. Nintendo’s controller works fine for browsing menus and app UIs, but flip it on its side and it’s a fairly capable, if slightly basic, games controller. By contrast, flip Apple’s on its side and you see the difference. Buttons are crammed towards the centre, and there’s no physical directional controller. The latter issue can be readily dismissed if you’re not desperate for it to be 1987 all over again, but the former means you’re largely limited to tilt/tap or swiping with your left thumb. The concern is Apple’s rules will severely limit even remotely complex fare on Apple TV from a control standpoint, or those games will have to figure out an extremely dumbed-down mode specifically designed for the Siri Remote. This will affect more games than you might realise. Games that rely on twin-stick/two-thumb input (commonplace on iOS) will have to revert to single-thumb input, with auto-aim for shooters. Platform games could be very tricky to implement. Flick up to jump? Urgh. And anything requiring directional control and action buttons could be a problem. When your new controller may have trouble supporting games that need anything beyond tilt-and-tap or directional controls alone, that should send alarm bells ringing. As Andrew Bryant remarked to me on Twitter, it won’t be a surprise if Apple changes tack, on realising a AAA title it wants to bang on about at a keynote cannot come to Apple TV with these restrictions. Additionally, I know plenty of game devs, and they’re often keen to rise to a challenge. I suspect we’ll, despite Apple’s decisions, see at least a reasonable number of innovative titles on Apple TV. Here’s hoping on both counts, because as I recently wrote for Stuff, it would be a crying shame if a piece of hardware that could be broadly transformative for gaming ends up as yet another also-ran.